Is culinary lavender different from other lavender? No, it’s just the way it’s grown. At Downderry we don’t reach for chemicals at the slightest hint of a bug or a lurgie. Not that our lavenders have many. Instead, we see what cultural conditions can be improved. We prefer to use plant invigorators or biological controls that work with the plants and the environment. All treatments we use are approved for culinary herbs. Can you use all lavenders for any culinary use? To a point, yes. However, it’s advisable to adopt these three levels of use: decoration, light cooking and intensive cooking. 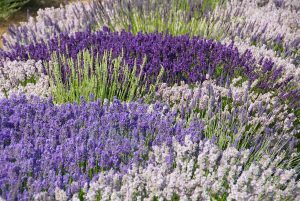 Decorating desserts and salads with the individual flowers from any lavenders and with the ‘ears’ of frost-hardy lavenders, provides a beautifully edible combination. In light cooking e.g. biscuits, shortbread and incorporation in sugar and desserts, it’s best to use the angustifolia cultivars. With this type of culinary use the whole calyx is used. That’s the bit the flower emerges from. The calyx is also where most of the oil in lavender is found, secreted in glands. When those glands are bruised by gently pressing or by cooking, they are burst and release the oil, but it’s not much! A whole mature angustifolia lavender with hundreds of flower heads may produce half a teaspoon of oil. About 0.5-1.3% of the biomass of a single plant is oil. There are perhaps 50-100 calyces per head, so a few calyces in each biscuit or dessert just adds the hint of a summer’s day. Not the punch of a whole summer season of flavour! Cultivars of this species of lavender have a soft, sweet, refreshing and floral scent and flavour. Principally this is because of the high linalool and linalyl acetate in the oil. Typically this accounts for 25-40% of each oil component. The low camphor content of their oil also helps. This is about 0-0.5% of the total volume of oil. Leaves of some frost hardy lavenders can also be used in desserts, especially ice cream. The most astringent lavenders are the x intermedia and x chaytorae cultivars. This is because there is more oil in the plants. Typically 1-4% and although the linalool and linalyl acetate content of the oil is almost as high as for the angustifolia, about 8% of the oil is camphor. These lavenders often also have a hefty dollop of 1,8-Cineole in the oil. Maybe 7% of oil content. This is the chemical that gives a eucalyptus scent and flavour. It’s therefore advisable to cook these for longer, perhaps in a casserole or similar to mellow the flavour. The internet is replete with recipes using lavender. With more experimental cooking and cosmopolitan tastes almost anything goes. Our advice is to follow the three levels of use above, to fully appreciate and enjoy the floral flavour of this most versatile plant.